Often times, the term SEO is mentioned in derogatory terms. With many of the poor techniques people use to garner site traffic, it's not hard to see why. However, Aaron Walter has recently finished a book entitled Building Findable Websites which casts a wide net on the concept of building a quality web site that goes well beyond just the mere topic of SEO. rediscover valuable content they've found. The book covers plenty of topics including SEO, microformats, and integrating third-party APIs like Google Search. The supporting site also has plenty of supporting content including five additional chapters. Much of the content is geared heavily to content producers, like bloggers. The book tries to be very inclusive with its target audience, being high level enough for managers while having enough technical tidbits for implementers. If it sounds like I'm a little biased, I probably am. Aaron Walter asked me to provide the technical editing for the book, which I was pleased to have the opportunity to do so. Aaron's writing is comfortable and straightforward and it was fun working with Aaron on the book. I really enjoyed reading the book and working with Aaron to make sure the technical examples in the book were accurate and included best practice approaches. The book is published by New Riders and is available through Amazon. You never concluded if the book is benefiting or not? IMO it is the best book out on the subject â€“ he covers a great deal of ground and does justice to each. Web standards, microformats, on-page SEO, server-side tweaks (some great .htaccess tips), the list goes on. It's really well done, I hope it gets the attention it deserves. Thanks for the review Snook. I haven't had as much time to read lately, and this seems like a good book to jump into. @Haris: I didn't want to be too effusive. But yes, I'd most definitely say so. I certainly learned a thing or two when I was reading the book â€” most notably about the webmaster tools that Google offers up that I wasn't aware of before. 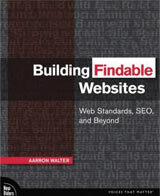 Agree Aarron Walters's Building Findable Websites is a very useful book! i learned lots. I bought this book following a reading of Arroon's recent article on A List Apart. Most of the stuff I already knew but there are some things that had never occured to me as having impact on findability. Overall great book. Highly recommended if you're not a Findability Guru yet. Another book for my wishlist, the list keeps growing. This is something that I'm definitely putting on my wish list. Can't wait. A really interesting book that includes the whole specter of a website; design, concept, markup, findability, accessibility, and advertising. I would certainly recomment it. Looks like a good read. Ordered! It's nice to see a so-called "white-hat" SEO book hit the shelves for once; most books on this subject that I've come across tend to focus on dubious practices that will more that likely get you banned from the search engines. Well done, Aarron and Johnathan: I can't wait to read it (and I must say that the supporting website is very nice-looking, too!). That said, one seemingly simple yet relatively deep and complicated question has always bothered me: when does localization go so far that it becomes censorship? And is that something one should accept?